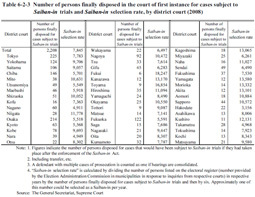 Table 6-2-2 shows the number of persons finally disposed in the court of first instance for cases subject to Saiban-in trials (refers to cases that would have been subject to Saiban-in trials if they had taken place after enforcement of the Saiban-in Act) by type of offense over the last five years. The number of persons finally disposed in the court of first instance for cases subject to Saiban-in trials in 2008 was 2,208 (down 9.4% from the previous year), accounting for 3.3% of persons finally disposed in the court of first instance in district courts (Source: The General Secretariat, Supreme Court). By type of offense, homicide was the largest in number with 557, followed by robbery causing injury with 511, and arson to an inhabited structure, etc. with 223. Table 6-2-3 shows the number of persons finally disposed in the court of first instance for cases at each district court subject to Saiban-in trials and the Saiban-in selection rate in 2008 (refers to the number calculated by dividing the number of persons listed on the electoral register (number provided by the Election Administration Commission in municipalities in response to inquiries from respective courts) in respective years by the number of persons finally disposed for cases subject to Saiban-in trials and then by six (the number of Saiban-ins in principle); approximately one of this number could be selected as a Saiban-in per year). Fig. 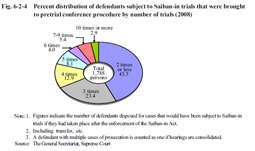 6-2-4 shows the percent distribution of defendants subject to Saiban-in trials that were then brought to the pretrial conference procedure and finally disposed in the court of first instance in 2008, by number of trials. It provides a rough estimate of the trend in number of trials held for a case subject to Saiban-in trials. The proportion of those for which trials were held three times or less was 66.9% and five times or less was 87.8%. The average number of trials held was 3.5 times. In addition, a trial took 7.1 months on average (Source: The General Secretariat, Supreme Court). 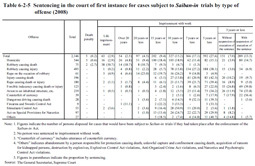 Table 6-2-5 shows the sentencing for persons convicted in the court of first instance for cases subject to Saiban-in trials in 2008, by type of offense. The Saiban-in system first commenced on May 21, 2009 and the first Saiban-in trial was held at the Tokyo District Court from August 3 to 6 in 2009.